Fastlane Pinball Game - Fastlane Pinball is a game you can play free. Fastlane Pinball free game is one of more than 400 free Games you can download at Free Ride Games, You play Michael James Smith who carries the burden of knowing how and when the world will come to an end. The vision you had was so clear, it just could not be read in any other way than the world's demise. So what do you do? 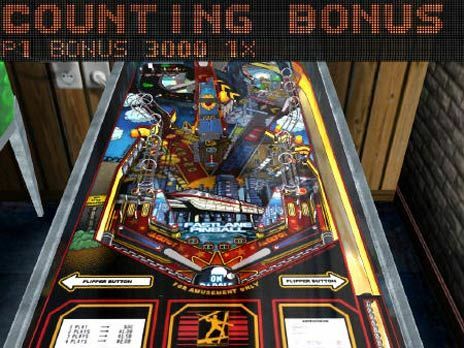 You get up from your couch, drag yourself to the nearest bar and start playing a great game of pinballandFastlane Pinball that is! Cause hey, all the things you know, right, couldn't bother you? You just want to clear your mind with a good old-fashioned game of pinball! Free Ride Games is the only place where you can download over 300 top games for free, including Hidden Object games, Time Management games, Match Three games, Sports games, Puzzle games, Arcade games, Card games, Board games, Flash games, Fashion games, Food games, Online games, Word games and many more. We have hundreds of choices from the leading game publishers like iWin, PlayFirst, Sandlot Games, Mumbo Jumbo etc. Download Fastlane Pinball free game and play it now.